We’d love your help. Let us know what’s wrong with this preview of Time Bomb by Joelle Charbonneau. They couldn't be more different, but before the morning's over, they'll all be trapped in a school that A congressman's daughter who has to be perfect. A star quarterback with a secret. A guy who's tired of being ignored. A clarinet player who's done trying to fit in. An orphaned rebel who wants to teach someone a lesson. A guy who wants people to see him, not his religion. To ask other readers questions about Time Bomb, please sign up. When I first saw the description of Time Bomb by Joelle Charbonneau I couldn’t help but be extremely curious. Last year I had heard all the buzz for This Is Where It Ends and had high hopes when I picked that one up only to be really disappointed. However, after reading Time Bomb I have to say that this one was what I was looking for last year. For me as a reader I had thought This is Where It Ends completely lacked character development and I simply was never drawn into the students stories or b When I first saw the description of Time Bomb by Joelle Charbonneau I couldn’t help but be extremely curious. Last year I had heard all the buzz for This Is Where It Ends and had high hopes when I picked that one up only to be really disappointed. However, after reading Time Bomb I have to say that this one was what I was looking for last year. For me as a reader I had thought This is Where It Ends completely lacked character development and I simply was never drawn into the students stories or brought to any kind of level of caring as they went through such a horrific event. I also thought that the author had taken the opportunity to write about a school with diversity in her characters and turned it into something that felt awkward at any mention of the diversity. Time Bomb made such an improvement on those major areas that had bothered me in This Is Where It Ends and actually brought a horrific and very much a realistic event to life. The entire book takes place over a couple of hours during a time a few students were in their school when bombs began to explode. It changes the point of view between six main characters that are each still alive and struggling with how to get out of the school. The book has a very intense vibe to it as the story unfolds but in the back of my mind I also made the comparison to the Breakfast Club with the group that formed. We had the football star, the princess who is a Senator’s daughter and Ms. Perfect of the school, the tattooed bad boy, the overweight and bullied outsider, but then stretching the cast of characters even more and bringing the story into this decade was the boy who had not only just come out to his family as gay but was also a mixed race, and then we had a Muslim student who struggled daily with the prejudices against him. As the story began and with each chapter changing the point of view it was easy to see that the entire group all had their own secrets and struggles. It became clear that all would have a motive for being behind the bombing so it leads the readers to the question of which one really did it? With a short cast of suspects I’m sure many may guess but regardless this was one that made me feel I’d stepped into this horrible scenario and was on the edge of my seat waiting for the outcome. Not terribly impressed with this. I think that in 2018, books about topics like mass violence in schools need to have moral, psychological and political complexity. I've read similar books (I'm mainly thinking of This Is Where It Ends - you can read my review of that here. For me, this book had many of the same issues - lots of POVs, uneven character development, and a rushed, info-dumpy ending that left me completely confused. 1. You're thrown right into the action with these characters and the Not terribly impressed with this. I think that in 2018, books about topics like mass violence in schools need to have moral, psychological and political complexity. 1. You're thrown right into the action with these characters and the book needs to get you to quickly relate to and care about them. I had tremendous empathy/concern for their situation, but I didn't feel like I got to know each of them the way I hoped. Points for diversity, but some characters were better-developed than others. I kept getting the two athletes mixed up. Diana was a walking stereotype - the rich, uptight blond girl we've seen a million times before. Z and Cas felt very flat to me. I think Rashid had by far the most interesting POV, though I can't speak to its authenticity. 2. Not the author/publisher's fault at all, but it was very unfortunate timing that this released a month after the horrific Parkland school shooting. This book seemed to have a (slight) political bent, but given the recent surge of anger and frustration surrounding school violence, this felt out of touch with the current mood of the country. 3. This was (also unfortunately) a book that focused more on the suspense than shedding light on a complex and important topic. The guilty person's motivation was incredibly confusing. The quick info-dump explanation at the end made it all seem not very well thought-out. If you thought This Is How It Ends was amazing, then you might want to try this, but for me this one needed more thought, more psychological depth, more political edge. It's the week before a new school year will begin at Hallwood high school, but the doors are open to students and teachers looking to get a head start on what they need to do. Some are setting up their classrooms, others are getting their student ID's or fixing their schedules... but there are few who entered the building with questionable intentions, set on doing something so drastic the whole world would have to take notice. On a day the high school was supposed to be empty (at least, by the t It's the week before a new school year will begin at Hallwood high school, but the doors are open to students and teachers looking to get a head start on what they need to do. Some are setting up their classrooms, others are getting their student ID's or fixing their schedules... but there are few who entered the building with questionable intentions, set on doing something so drastic the whole world would have to take notice. On a day the high school was supposed to be empty (at least, by the time the incident occurred), a bomb exploded from somewhere inside, trapping all who were still in there and causing serious harm to most of them. In the span of just a few hours, five bombs had been detonated, leaving the building in shambles, claiming lives and changing everyone involved forever. Somewhere between the first explosion and the last, seven teenagers are grouped by chance during their desperate struggles to escape: Cas, Z, Frankie, Tad, Rashid, Diana and Kaitlin. Each one is totally different from the other, but differences aside, they all have one common goal: make it out alive. However, when they find a radio and listen in on what the media is brodcasting, they come to the shocking realization that they're stuck inside with the bomber. What's worse? The bomber is one of them. While the firefighters and police do what they can from the outside, not being able to come in because of the danger, the teenagers have to fend for themselves in the deadly environment. They all went to school that day to make a point to either keep up appearances or to make the world see them in an entirely different way. Little by little, we get to know them as they try to battle fire and smoke with the walls collapsing around them, clambering through the rubble in search of an exit, fighting for their lives while being injured and terrified. The more that's revealed about any of them, the more you see that any one of them could be the mastermind behind this domestic attack. One has a bomb, another has a gun, but all of them has their own reason for wanting to cause mayhem. There's the daughter of a congressman who has to keep up her perfect facade, least she give the public a reason to vote her father out. The star quaterback with a secret he desperately wants to stay burried. The boy who's tired of being ignored and having his feelings brushed aside. A girl who's done trying to fit in just to avoid being bullied. A guy who wants to be seen for who is, not feared for the religion he follows. A tattooed orphan who wants to teach someone a lesson and a friend who wants to stop him from making a huge mistake. Each one is a suspect, but they all have to work together if they want to live to see another day. What will happen before the 5th bomb goes off? Not everyone will survive. 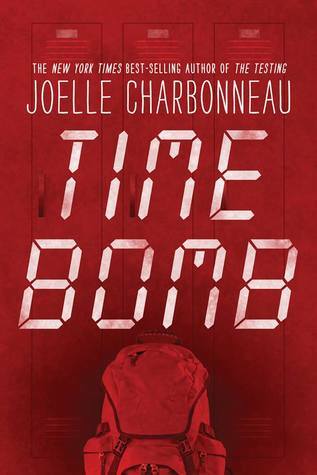 Time Bomb by Joelle Charbonneau is a thrilling YA mystery story about a bombing that takes place in a high school. I was torn between a three and four star rating for this novel - I did really enjoy this book, but I just felt let down by certain aspects. This story starts off right where the action is, giving us only a little about each character through out the book to keep the reader guessing. The Count down and non-stop suspenseful action and drama will keep you turning the pages - this was a very quick read for me because it was so hard to put this book down. The world building was great, even though this only takes place in a school, there are tons of descriptions and vivid imagery. This book is told in the POV's of six out of the seven MC's, which I enjoyed. However, to keep the mystery going we weren't given very much on any of the characters, and while I felt horrible for what they were going through, I can't really say I grew attached to any one of them. Each one was stereotyped by their peers, but they all had their own story to tell - which reminded me a lot of The Breakfast Club... but with a deadly twist. I loved how this tragedy opened their eyes to their own bias and prejudices, however, we don't get to see them really learn or grow from it. I suppose the bombing brought some of the survives closer, and they ended up learning a lot about themselves, but I'm not sure they took much else out of that situation, which was unfortunate. A couple didn't even really change at all, and went their separate ways like nothing had ever happened. Yes, every one deals with things in different ways, but I couldn't help feel let down by that. It was hard to tell who the bomber was, everyone had a motive, but not everyone was actually out to hurt other people. At one point I did assume it was a certain character, and even though I switched back and forth a few times, I always kept that one in mind and I ended up being right in the end. But I wouldn't say that this was predictable at all, all the twists kept me second guessing myself and made everything exciting. I would recommend this to anyone who enjoys fast paced, action packed stories about realistic events. This book touches on a lot of important topics such as school violence, homophobia, suicide, and prejudice. Unfortually I wish the characters would have shown that they learned to be more accepting and maybe wanted to work to putting an end to school violence, instead of the contemporary-like ending of everyone just trying to move on in their own way. With all the school violence that's going on today, I feel this book could have helped send a bigger message to its readers. All in all, though, I did enjoy this story and will be on the look out for more from this author. Oh, wat was dit een goed boek! De test serie en Nodig van dezelfde schrijfster vond ik erg goed, dus ik was heel benieuwd naar deze. Ik vind het tof dat aan het begin van het boek alle personages een verdachte zijn. Allemaal hebben ze een totaal ander motief, maar iedereen zou het gedaan kunnen hebben. Dan leer je ze kennen, en ver tegen het einde realiseerde ik me ineens dat ik vrijwel iedereen als verdachte had afgeschreven, zonder dat ik precies kon aanwijzen op welk punt of waardoor. De schrijf Oh, wat was dit een goed boek! De test serie en Nodig van dezelfde schrijfster vond ik erg goed, dus ik was heel benieuwd naar deze. De schrijfster is en bij de mogelijke motieven, en bij hoe je aan het einde dus geen verdenkingen meer hebt, erg sterk in het laten zien hoeveel er achter het masker kan zitten dat we ophebben. Tegen het einde vond ik de spanningsboog een beetje inzakken, en degene die ik als enige nog verdacht vond bleek de schuldige te zijn, Die twee dingen zorgen ervoor dat het boek geen 5* krijgt. De 4* zijn wel echt dik, want het is een heel vlot en goed geschreven boek. Erg enthousiast over! i finally finished a book!!!!! i didn’t have time to read all week so i made it my mission to read as much as i could as soon as i got home today (i spent the week in Poland with my family). Time Bomb is about a group of students who happen to be at school the day a bomb goes off. they work together to find a way out of there, but everyone of them is hiding a secret. while being trapped, they find out that the bomber is still inside the building and possibly planning to set off more bombs, so th i finally finished a book!!!!! i didn’t have time to read all week so i made it my mission to read as much as i could as soon as i got home today (i spent the week in Poland with my family). Time Bomb is about a group of students who happen to be at school the day a bomb goes off. they work together to find a way out of there, but everyone of them is hiding a secret. while being trapped, they find out that the bomber is still inside the building and possibly planning to set off more bombs, so they all grow wary of each other. tbh when i first saw this on Netgalley, i thought it made for a good premise and it sort of reminded me of One Of Us Is Lying. however, the timing of the publication of this book is very unfortunate with the whole gun control debate and March for Our Lives going on in the US right now. this book is fairly short and easy to read so it didn’t take me long to finish it but it was hard for me to decide on a rating. overall, i think the story was fairly enjoyable. this book isn't even 300 pages so it was very quick and easy to read. i also really appreciated that the author incorporated the discussion of how Muslims are portayed by the media and how they're treated by society in relation to terrorism. Rashid was such a lovely and kind character and i Felt for him so much. he kept talking about his struggles with his religion and how people always judged and stereotyped him based on his religion and his outer appearance (ie. him having a beard). i really liked that the author challenged the idea of "all Muslims being terrorists" (honestly if you think that just unfollow me now) because it's so important for people to realise that you cannot generalise a whole group of marginalised people based on what a few of them did (especially with regards to everything that is happening right now). i have to admit i accidentally spoiled myself while reading through the reviews beforehand (i am NEVER doing that again!!!) so i knew who the bomber was from the very beginning. it kinda sucked because it took away from the whole mystery of the story but at the same time i could read between the lines and find little hints in the character's behaviour that alluded to them being the offender. "Er zijn nu al 4 bommen afgegaan, maar er schijnt nog een explosief in de school te zijn dat elk moment kan ontploffen." ~ p9. De nachtmerrie van iedere ouder, de hel voor ieder schoolgaand kind. Wat een indrukwekkend verhaal om te lezen! "Als jij wilt geloven dat ik een slecht mens ben, kan ik je niet tegenhouden." ~ p150. Tijdbom is een YA-thriller, waarin een bomexplosie op school centraal staat. Het verteld het verhaal van 6 jongeren die ten tijde van een aanslag in de school aanwezig zijn. Va "Er zijn nu al 4 bommen afgegaan, maar er schijnt nog een explosief in de school te zijn dat elk moment kan ontploffen." ~ p9. Tijdbom is een YA-thriller, waarin een bomexplosie op school centraal staat. Het verteld het verhaal van 6 jongeren die ten tijde van een aanslag in de school aanwezig zijn. Vanuit een wisselend perspectief lees je hun beleving van deze dag, en hun reden om juist die dag op school aanwezig te zijn. Maar wie zegt dat de aanslagpleger niet één van hen is? Joelle Charbonneau zorgt ervoor vanaf de eerste bladzijde dat je iedereen voldoende wantrouwt. Er wordt precies de juiste mysterie om elke personage gehouden, zodat je pas aan het einde de puzzelstukjes in elkaar kan passen. Dit zorgt ervoor dat je gewoon moet blijven lezen, totdat je zeker weet dat iedereen veilig is. Naja, iedereen... De personage zijn zeer uiteenlopend, waardoor er denk ik voor iedereen wel een tussen zit om een zwak voor te hebben. Om je een beetje extra zorgen om te maken. In het begin vroeg ik me af of het wel handig was om en verhaal vanuit 6 personages neer te zetten, maar uiteindelijk werkte het, juist op deze manier! "De media zijn machtig. Ze verslaan niet alleen het nieuws. De onderwerpen die ze voor de TV selecteren, vormen de manier van denken van mensen." ~ p242. Zo enthousiast en dan toch maar 4 sterren? Ik hoor het je vragen. Ja ik zit absoluut in de fangirl modus wat dit boek betreft, het enige waar ik een beetje meer zit is het einde. Zie het alsof je net heerlijk in je lievelings restaurant heb zitten smikkelen, met je favoriete voor- en hoofdgerecht. Je verheugt je enorm op dat ene luxe toetje, maar je wordt afgescheept met 1 bolletje vanille ijs. 1 bolletje! Beter dan dit kan ik het niet uitleggen zonder te spoileren. Dus nee, ik heb echt super lekker gegeten, maar ik mis dat laatste hapje! Four bombs explode inside a high school. Seven students trapped. One is the bomber. Another one gun has a gun. A senator’s daughter. A bullied girl. A Muslim. A mixed race gay football player. Another gay football player who also plays straight. An orphan and the girl trying to save him from himself. Not all will survive. Long before Parkland, I preordered TIME BOMB, a different take on school shooting meets The Breakfast Club. Joelle Charbonneau uses six third person points of view to lay out the moment by moment story which takes place over six hours (not including the epilogue). While TIME BOMB held my interest, I didn’t feel invested in the students and the story lacked tension possibly due to so many characters. I spent the first parts of the book thinking “I’m going to be SO MAD if Charbonneau makes Rashid the bomber.” Soon I had a different suspect, which turned out to be right (as well as obvious and unrealistic). Joelle Charbonneau's books rarely lack excitement, and Time Bomb pushes us right into the action on page one. There are several teen main characters, and we meet them all in initial spurts of a few pages each, imprinting their individual narratives in our minds. There's Diana, daughter of the U.S. senator who has proposed the Safety Through Education bill, a controversial measure designed to counteract school violence by incentivizing students to report suspicious behavior among their peers. We Joelle Charbonneau's books rarely lack excitement, and Time Bomb pushes us right into the action on page one. There are several teen main characters, and we meet them all in initial spurts of a few pages each, imprinting their individual narratives in our minds. There's Diana, daughter of the U.S. senator who has proposed the Safety Through Education bill, a controversial measure designed to counteract school violence by incentivizing students to report suspicious behavior among their peers. We meet Rashid, a Muslim boy used to being looked at askance. His religion forbids him from shaving his thick beard, and this presents him as a target for mockery by other high school students. Z, who was already jaded, is angrier than ever after his mother's death from cancer. He's being evicted from his house in a few weeks, and has no clear plan for the future. Tad and Frankie play on the school football team, and their short-lived romance is a source of bitterness for Tad. Frankie wants to pretend the kiss never happened, but Tad insists they talk it out, and demands Frankie meet him at school on a day that class won't be in session. Cas, an overweight girl, has endured some severe bullying incidents, though we don't find out the details yet. The lives of these six students are about to intersect in a survival drama that will make national news. Each of our characters has a reason for being at school that day, though their full motives are obscured from us. The action kicks into high gear when the first bomb destroys large sections of the school, killing some faculty members. The few students in the building roam the ruined hallways for help, dodging flames. Tad could have escaped shortly after the blast, but stopped to help Rashid. When the two of them surmise that a student is likely responsible for the bombing, Tad regards Rashid with suspicion. The kid is not only Muslim, but all of a sudden he's shaved his beard; why would he do that if not to avoid calling attention to his religious affiliation? Rashid also claimed he called 911 after the bomb went off, which Tad proves is a lie. Is Rashid responsible for the attack? "Those who are the most damaged don't ever admit they need help. It takes strength to admit that you want something to change, and it takes even more courage and strength to try to change it." Cas had planned her own act of violence that morning, but now she and Frankie, the most popular guy in school, are hunting together for a route out of the building. Police are surrounding the place, but can't enter to extract the trapped teens until they're sure all the bombs have gone off. Every once in a while a new explosion rocks the school. Z is uninjured, but Kaitlin's legs were crushed by a heavy piece of debris. As Tad, Rashid, Frankie, Cas, and Diana locate Z and Kaitlin, they realize Kaitlin must be evacuated soon if she's to survive. Tempers flare as the group argues between waiting for rescue or searching for a viable exit, but every one of them is chilled to the bone when they find a radio and hear the news announcement: one student in the building is in league with the bomber, though that student's identity is unconfirmed. None of our main characters is above suspicion, but they'll have to ferret out the guilty party and distance themselves before the next detonation eliminates the other six. With motives for violence not in short supply, which adolescent actually crossed the line from normal angst into terrorism? 3.5 ster. Artikel op 29-12 op de Hebban Young Adult Club, recensie daarna op mijn blog. Of op de laatste dag van 2018, of in de eerste week van januari 2019. Zes perspectieven (waarom 6??) en ik had van in het begin meteen door wie de dader was nog voor het begonnen was. Na een snelle vraag aan iemand die het gelezen had (ja of nee?) want ik twijfelde om door te lezen, bleek dat een ja te zijn. Dus ja... Het lijkt me ook erg langdradig en helemaal niet boeiend. Christine Charliers Bij Nodig wist ik niet wie het was. Hier wel. This was an extremely fast read for me; I flew through ‘Time Bomb’ in a matter of hours, and it almost felt like I was following a similar clock to the one that was ticking away in the book. Six exceedingly different students, not unlike seen with the setup in the movie ‘The Breakfast Club’, find themselves trapped together because of the horrific circumstance of someone having set off bombs at their school (although, conveniently, school isn't quite in session yet, so there aren’t mass casualti This was an extremely fast read for me; I flew through ‘Time Bomb’ in a matter of hours, and it almost felt like I was following a similar clock to the one that was ticking away in the book. Six exceedingly different students, not unlike seen with the setup in the movie ‘The Breakfast Club’, find themselves trapped together because of the horrific circumstance of someone having set off bombs at their school (although, conveniently, school isn't quite in session yet, so there aren’t mass casualties). The wrecked and damaged school that has them stuck inside, suspicious of each other, is a reminder of all the problems that schools represent for schoolchildren today: the gun debate because of the mass shootings inside schools, bullying, kids and their constant need to live up to certain standards, whether it’s their own or others’, unchecked mental illness, prejudice of others based on appearances...and by bringing ALL of this up in the teens’ conversations and through their own perspectives, Charbonneau makes the novel about more than just the bombs going off at this high school. The different stereotypes that the kids all fit into, serve to remind us that, right up until the end, when we find out ‘whodunnit’ all these kids are essentially ticking ‘time bombs’ waiting to go off. If not then, they could at some point. I think it’s easy to focus on the event of the bombs in this book, and kind of ignore that it’s all emblematic of the tumultuouness of teenagehood. Have you ever felt so distraught that you needed to take action? Have you ever wanted to blow something up? Hurt anyone? Well that is what this book is all about. Time Bomb follows six teenagers, who are going about their daily lives when they get stuck in their school after a bombing. They try to help each other, but things go haywire when they get rocked by more bombs and learn that one of them is helping with the bombings. This book is highly addictive, and a super easy and quick read (maybe too easy), especially since it covers an incident occurring within a school, which is happening more and more often these days. The book starts off by introducing the reader to each main character, and what their lives are like. Joelle Charbonneau wants the reader to understand how each character feels, and the problems they are going through. With this, you are always trying to guess who the bomber could be, and why, how, etc. The characters, however, are very stereotypical, but it enhances the book itself because you are always questioning whose problems are so bad that they decided to blow up the school. This aspect really helped make the book amazing because it constantly made you think, which created a bigger connection between the book and the reader. Another thing that really adds to the book is each character having their own problems and feelings they are going through, but each problem is something very serious that all teenagers face everyday. This was great to see because it brings awareness to the readers that those feelings and problems aren’t wrong, and others feel them too, so talk about it. The book has strong messages throughout its entirety; suicide, being an outsider, bullying, etc. Time Bomb really does focus on everyday lives and even finds the time to explore relationships. This is kind of funny because who would be thinking about that when you are trapped in a blown-up school, but perhaps it shows the predictability of high school students. That being said, the rest of the book isn’t predictable. Instead it is intense and fills your mind full of questions, which is a tell-tale sign of a good book. As you read you think it was one person, but then they say or do something and then you’re thinking it has to be someone else. Each chapter is full of surprises and it really gets your heart racing. When things just start to calm down, all of a sudden then just become crazy again, which makes the book very hard to put down. Most of the chapters are short with an average of six pages per chapter, and while some books in this format can be hard and frustrating to read, it only strengthens the intensity of it. The reason for the short chapters is because they are told from different character’s points of view to really showcase what that character is feeling in the heat of the moment. The short chapters also contribute to the quick easy read it is, which may be a good thing or a bad thing for some, but it does give the book a beginners YA feel. Despite this, the book was well written. The reader understands what’s going on and feels what the characters are feeling which hooks the reader until the very end. The author also uses quotes at the end of some chapters to help justify what just happened and if you’re like me, any books that have quotes in it receive extra points. But on the other hand, there were some scenes where it was hard to visualise what was going on. However, this may just be the type of situation although sometimes a sentence would be completely different from what you were thinking of and you would get slightly confused for a second. This book is going to stay with me for a long time. It's the kind of story you want to discuss with as many people as possible and that you can't stop thinking about. A very sensitive and thought-provoking exploration of difficult themes, featuring relateable characters and a narrative it's difficult to put down. - The main cluster of characters. All of them represented different high-school tropes, but they had depth to them e.g the intersectionality of This book is going to stay with me for a long time. It's the kind of story you want to discuss with as many people as possible and that you can't stop thinking about. A very sensitive and thought-provoking exploration of difficult themes, featuring relateable characters and a narrative it's difficult to put down. - The main cluster of characters. All of them represented different high-school tropes, but they had depth to them e.g the intersectionality of Tad's mixed race heritage and struggles with recently coming out as gay. Rashid's story was particularly heart-breaking for me and his interactions with Tad were some of my favourite in the book. - The identity of the bomber was possible to guess and their reasons made sense in a twisted kind of way, which made the ending all the more heartbreaking, especially when juxtaposed with all the destruction which had happened in the school. - The ending. Everything wasn't all magically solved when the bomber was found and the teenagers' problems didn't just go away. That did leave me wanting more (especially about Frankie and the relationship between Diana and Tim), but it felt more realistic and honest as a response to what had happened. Definitely the book to read if you want an exploration of society and schools' responses to the threat of terror attacks, not to mention the darker side of high school and growing up. The whodunit part of the story unfolding had me completely biting my nails. The fact that these teens had to rely on each other when they knew one of them was responsible for the bombing is intense! Thanks to the publisher for providing an ARC in exchange for an honest review, This doesn't in any way influence my opinion on it. Time Bomb is the second book I'm reading from Joelle Charbonneau and I'm once again enamored by how talented she is. Her writing is so transcendent it's like the words come alive and she proves herself a master storyteller once more with Time Bomb. Time Bomb is about a group of High School students who get stuck in the second floor of their school when a bomb goes o Thanks to the publisher for providing an ARC in exchange for an honest review, This doesn't in any way influence my opinion on it. Time Bomb is about a group of High School students who get stuck in the second floor of their school when a bomb goes off, Then they find out that one of them is the bomber and another bomb remains. Not only are they going to have to strive to survive, they also have to figure it before it's too late. The story begins on the morning of the incident. 1)Diana, the daughter of the Congressman who has always had to be perfect and a good model to other teens. She's never had a friend and her father doesn't really have much time for her along with her controlling stepmother. Diana was quite desperate to prove to her father that she can be of use to him than being picture perfect and sitting still and looking pretty. 2)Rashid is a Muslim boy/geek who has a hard time fitting in with peers due to his faith and the fact that high school students can at time just be cruel. He never had the courage to face them but he knew something had to change. 3)Z is a boy who lost his mother to cancer and just got kicked out by his crappy landlord, He pushed everyone away and retreated into himself except his friend Kaitlin who never deserted him. Z was angry at everything and everyone finally decided to take a huge step. 4)Tad is a closeted jock (in school at least) who hooked up with another fellow jock over the summer but is now being ignored. He also came out to his family a few months ago but ever since then, things have been awkward between them. He was tired of being ignored and treated like that so he chose to do something about it. 5)Cas is an overweight girl who has become somewhat of a social pariah due to the way she looks, vicious rumors spread about her and embarrassing incidents from her previous school on the web. Cas has endured the snide comments, the judging looks, the bullying and the disconnect with her family. But she was done being the punching bag and everything was going to change for good. 6)Frankie is the Quarterback who is deeply entrenched in secrets. He's planning something huge but he's relying on the fact that the school needs him for suspicion to be cast away from him. He's a character whose motivations are purposely ambiguous so he's kinda hard to figure out but that's what makes this fun, The DRAMA. These six teenagers go through a life changing horrifying event, While it's a terrible situation, I have to admit, Time Bomb is absolutely riveting and compelling. Not once did I feel like putting it down, I blew through the pages at a feverish pace, devouring the words like a starved woman. One interesting things about this book is that all the main characters are suspects, they all have the motive to commit such an offence. But piecing (or at least trying to and failing) the puzzle together and figuring out who did it kept me on the edge of my seat. It could literally be any of them. But it's not just a story of Who is It?. It's more than that, it's deeply personal as it deals with acceptance, self esteem, sexuality, suicide, anger, bullying, religion and how important it is to be seen and heard. Time Bomb will resonate with a lot of readers as we will find a bit of ourselves in some of these characters, I commend the author for making them so relatable. High School is a tough time and this book deals with the toll it takes on teenager, It's the little unnoticeable things that matter. The moments before the end propelled the storyline towards a powerful and emotional ending. Knowing who the bomber was ended up not being too surprising but the motives behind the action was heart wrenching. In the end, they were all not the people that entered their High School that morning. They have all fundamentally changed and that experience will either make or break them. I was satisfied with the conclusion of this book and I really wish every reader out there will pick it up, Joelle Charbonneau has outdone herself. I happily and eagerly recommend this book to everyone because it's just too mesmerising. Joelle's Charbonneau's Time Bomb is a standalone, young adult, thriller & suspense novel featuring a variety of characters, and a variety of narratives. It is 9 days until the start of the new school year. As a bomb goes off in the school, it is possible to say that every one of these characters could be the one responsible. For 7 teens, their lives are about to be changed forever. My biggest issue with this book was just how stereotyp This book was one of my highly anticipated releases of March. Especially with whats currently going on with #MarchForOurLives, I was excited to see how the author tackles this subject. However, I found this book to be extremely predictable and too stereotypical to have really added anything to the current discussion. I felt that this book should have been much more complex than it was in so many ways than it was and it was just left lacking . My biggest issue with this book was just how stereotypical all of our main players were. There was no real depth to any of the characters beyond their stereotypes and some of the characters really don't change or take ANYTHING from the experience they went through and shared. The author did include a diverse set of characters - but they needed to be fleshed out and developed beyond the social stereotypes and the predictable secrets that they were holding onto. From Jocks who are in the closet, to a congressman daughter who feels like she is trapped being a person that she doesn't want to be, to a teen who ha lost his mum and hates the whole world (and the friend he has who is trying to save him from himself), to the muslim who is IMMEDIATELY blamed for the situation without proof and the student who is bullied to the point of suicide - the characters are a wide cast of different people, but I wanted to get to know them on a deeper level and not just for their 'secrets'. I feel like this book tried to introduce too many social issues and didn't actually talk about them in any great detail. I would have rather the book focused on 1 or 2 and had actually discussed them in depth, as opposed to touching on various and not bringing anything to the bigger discussion. I also liked the fact that Charbonneau introduced a political aspect with the legislation that Diana's father was trying to pass (I don't want to spoil it), but, again, I think it could have been discussed on a larger and deeper scale in a way that would have mattered. This book was also too predictable for me. I already knew who it was right from the very beginning chapter of that character and I had guessed why they did it. It was too obvious in the way in which certain things were described and the things that they did - so, in this sense, I would have liked a bit more of a whodunnit that would have had me guessing throughout. I would have also liked to have seen more psychologically repercussions after the event. I felt that only one character really showed any sign of struggling to come to terms with what had happened, whilst I felt that a couple of other really took nothing away from the experience itself. It annoyed me that there didn't seem to be any character development at all and it was almost like nothing happened for them. A congressman's daughter who has to be perfect. A star quarterback with a secret. A guy who's tired of being ignored. A clarinet player who's done trying to fit in. An orphaned rebel who wants to teach someone a lesson. A guy who wants people to see him, not his religion. Time bomb follows the perspective of six different individuals, trapped inside their High School, as a series of bombs rocks their world. Time Bomb is a riveting story of school bullying, stereotypes, anxiety, depression, and m A congressman's daughter who has to be perfect. A star quarterback with a secret. A guy who's tired of being ignored. A clarinet player who's done trying to fit in. An orphaned rebel who wants to teach someone a lesson. A guy who wants people to see him, not his religion. Time bomb follows the perspective of six different individuals, trapped inside their High School, as a series of bombs rocks their world. Time Bomb is a riveting story of school bullying, stereotypes, anxiety, depression, and most importantly, survival. After reading This Is Where It Ends, hearing the premiss of Time Bomb I was extremely intrigued. We get to bounce back and forth between the different characters slowly as we're introduced to each one, and basically lead to creating our own ideas of who the possible bomber could be. Of course, as soon as I thought it could be one person, I would read the next chapter and question my choice. In the end, I have to say that I was thoroughly surprised at who the actual culprit was, and also surprised by the actions that follow as the students discover for themselves. Oh my word! This book is so gripping! Trust me when I say that you'll have a hard time putting it down! At first I thought the transition of focus between 5-6 characters would be hard to follow, but after all the kids are at the school you barely notice it. The story flows so well and you can't help but wonder what each of the students is planning when they go to school a week before it starts. I appreciate that the author doesn't overuse curse words, like many other YA novels do. There are minor ones that are thrown in (at what I'd say are appropriate times in the story). This is a book I will be highly recommending to everyone when it is published next year! I received an ARC copy of this book through NetGalley in exchange for an honest review. Imagine One of Us Is Lying meets The Breakfast Club and chuck in some bombs and this is what you get! The narrative is split between 6 characters, all defined and distinctive, and all with their own secrets and personal agendas. It was interesting to see how their revelations played out and his their relationships developed. Ive not read any of the authors work before but I enjoyed this so I certainly will in future, I especially liked how fast paced this was as it kept me gripped and I read it in Imagine One of Us Is Lying meets The Breakfast Club and chuck in some bombs and this is what you get! Ive not read any of the authors work before but I enjoyed this so I certainly will in future, I especially liked how fast paced this was as it kept me gripped and I read it in one go. It’d make a very good film.